Canadian singer-songwriter Awna Teixeira has toured the world with a variety of Rootsy ensembles over the years; finding fame (?) with crowd favourites Po’ Girl and her debut solo album WHERE THE DARKNESS GOES in 2012 drew favorable reviews from magazines, websites and broadsheet newspapers alike; all hailing a ‘Star in the making’ and then it all went quiet. Her latest album WILD ONE begins where the previous release left off and takes an almighty left turn into the darkest corners of Lo-Fi territory, reminding me at times of the Twin Peaks soundtrack, Fleet Foxes and even very early Cowboy Junkies; all of whom I love. A deep resonating Omnichord, which sounds uncannily like a church organ, opens the first track The Light in You; slowly followed by Teixeira’s haunting voice which never challenges the organ for dominance. At times it’s difficult to make out her voice; which is a theme throughout the album; but the track is stunning in its simplicity. Now living in Salt Lake City, Awna chose to drive to her home city of Toronto to record WILD ONE and following a successful Kickstarter campaign; that passion and desire come across in every word and note, making this a particularly personal diary of stories. This isn’t an easy listen at times; especially songs like Blue Heart on Your Sleeve which is about her Grandmother’s life long battle with mental illness; and other songs like Yellow Moon and Freedom Hunter are so fragile I worried that I may damage them if I listened too hard; thankfully I didn’t and they are still there for the discerning music fan to fall in love with over and over again. 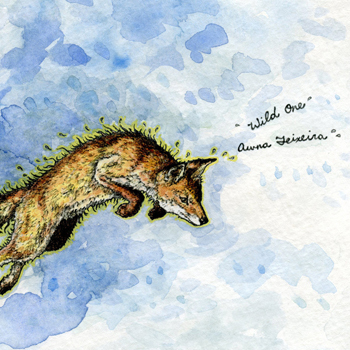 WILD ONE by the enchanting Awna Teixeira will undoubtedly be on many critics Albums of 2015 lists at the end of the year.